Having a baby doesn't mean the end of your active lifestyle. Not if you have a Chariot Carrier. And with 11 carriers from which to choose in Chariot's 2005 line-up, you are sure to find a great fit for you, your child and your activity. You want it all? You get it with Chariot's X-Country Series carriers. For the active adult who demands the best, the X-Country Series lets you forget the babysitter and take the kids along in comfort and style for real family togetherness. From Central Park to Yosemite's Half Dome the X-Country Series lets mom and dad run, bicycle, ski and hike their way with their kids into parental bliss. You'll love cycling again, now with your kids in tow. Enjoy two-wheeled workouts, trips to the grocery, and cruises around the neighborhood. 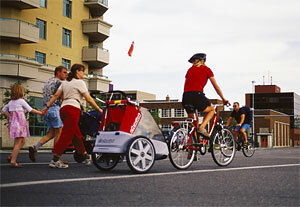 Designed by bicycling enthusiasts specifically for cycling, the trailers are easy to pull, child friendly and comfortable, boast numerous innovative lifestyle features, and are at home on any bike path, lane or roadway. Plus they convert. For the active adult who just wants to run, run, run, the Chariot Cavalier matches pace. With its top-shelf design, rigid, lightweight frame, sports-car like control and plush interior, the Cavalier is a joy for both the parent and the child. Just lace up the shoes and you're out the door. So, you just have to be different. Well, the Chariot SideCarrier for bicycles is for you. Aimed at those who want style served up with their function, the SideCarrier provides easy parenting and conversation while bicycling because the child and parent travel side-by-side. Plus, the SideCarrier makes that all import fashion statement. Comfort, flair, function? You bet. "We believe we have a great 2005 line-up of child carriers," says Jeff Mah, Chariot's Marketing and Events Coordinator, and father of three. "Each series was designed for a specific activities in mind, and most of the carriers feature 5-activity use allowing a parent to stroll, jog, run, bicycle, hike, even ski with their child accompanying them every step, pedal stroke, or shoosh of the way." Chariot Carriers, Inc. is a leading designer and manufacturer focused on innovative child carriers for the active parent. Its CTS" technology allows a carrier to be easily transformed for cycling, jogging, strolling, hiking or skiing. For more information, log onto the Internet at www.chariotcarriers.com, or call 1-800-262-8651.